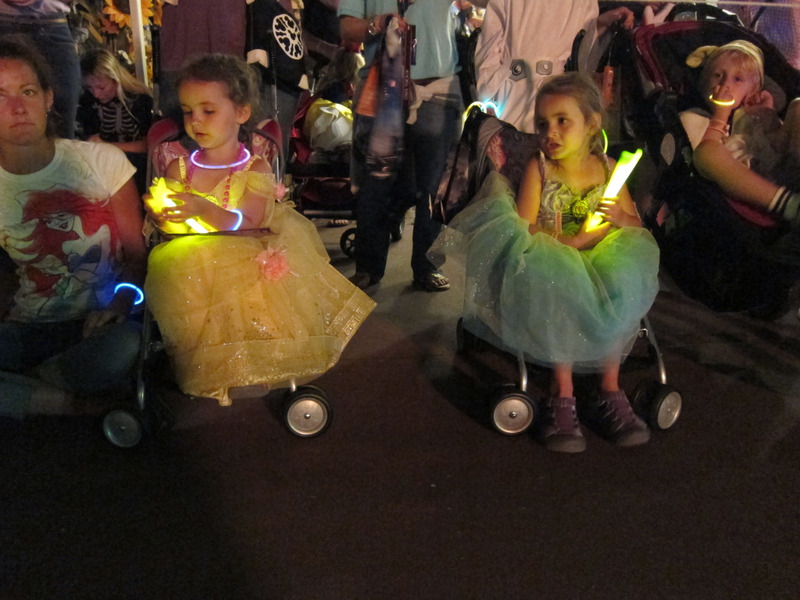 1) For the Boo To You Halloween parade at Mickey’s Not So Scary Halloween Party we brought extra glow stick bracelets. For a buck at the Target $1 section I picked up a few tubes. The little girls each got an extra tube to open and hand out bracelets to the children around us. As a bonus, the girls LOVED doing this! They really enjoyed making the other kids happy. It was a nice way to burn some time while waiting for the parade to start too. This would be a nice surprise for any nighttime parade or fireworks show. 2) Making up a few small cards for Cast Members that go the extra mile. Disney Cast Members are almost always amazing, but sometimes you run into one that is really special. For these Cast Members it’s nice to have a little card just to say “Thank You” and let them know they really made your day. It’s also a good idea to stop by Guest Services near the entrance of each park and have a note put on their file if they did something really amazing. They get credit for these from the higher-ups! 3) If you get a balloon at Disney, consider handing it at checkout to a family just coming in. The balloons seem to last forever, and it’s not like you can take it with you (if you fly!) so why not let another family enjoy? This goes for things like unfinished cases of water or snacks as well! If you can’t take them, another family would surely appreciate and be able to use them during their trip! 4) Offer to take a family photo. Of course there are several PhotoPass photographers all around the Disney parks, but maybe you spot a family trying to take a picture at a resort, or somewhere out of the PhotoPass photographer’s range. Help them out! A family photo with everyone in it is a priceless gift. 5) The most obvious (and I think most important) act of kindness you can do is show others patience. Lots of times in the parks we’re all hot and tired and overwhelmed and it’s easy to be bothered by even the smallest annoyance. Try your hardest to show kindness to others who are probably just trying their best! What kind of Disney Random Acts of kindness have you done? Is there something we should add to our list for the next trip?